. 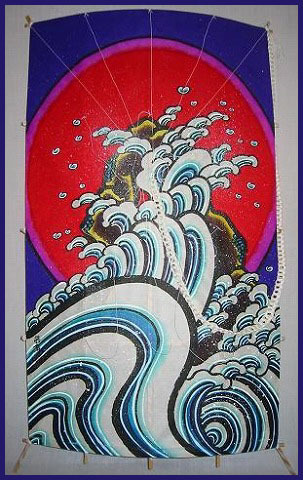 tako　凧 Kites of Japan - Introduction . 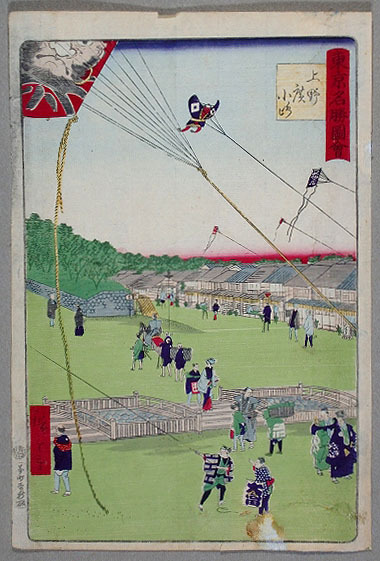 Flying a kite in Edo was a pastime during the New Year holidays and in spring, when the wind was blowing strong, enjoyed by young and old, men and women!
. 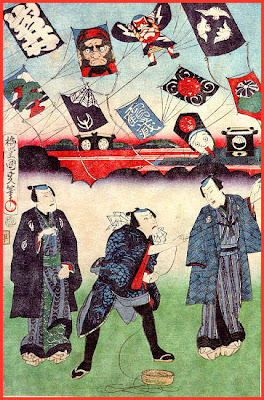 wadako 和凧 Japanese Kite . 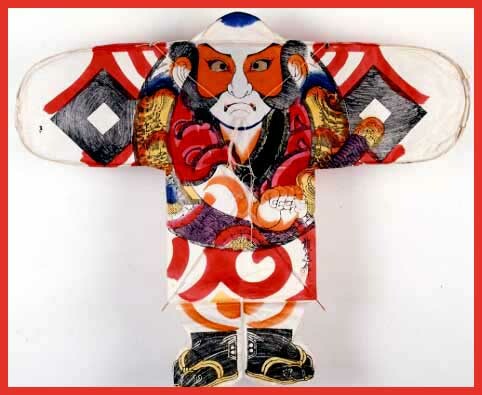 'Edo' is the old name of Tokyo and this kite is one of the most decorative kite today in Japan. 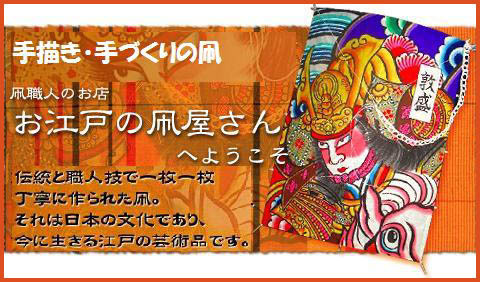 Its painting designed was depicted for famous historical stories or traditional stories in Japan. 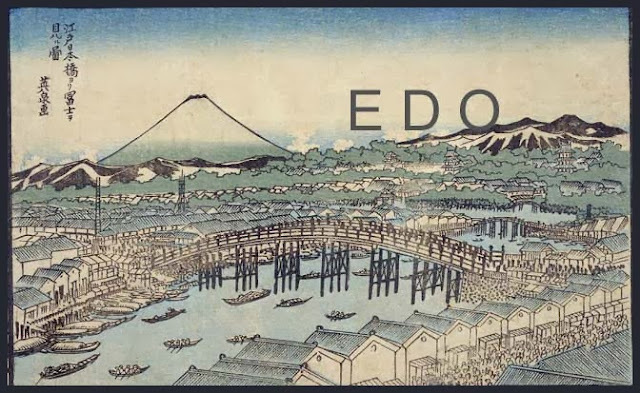 Today, Edo-dako is designed so as to be assembled at the flying site because of convenience for handling. The number of bridles of Edo dako are 11 or 14 and each length of strings is about 20-25 times of its height. It is very difficult to adjust the center position of strings for good flight. It is famous for its large hummer on the top of kite. This kite is fit for the wind speed of 5 m/second - 15m/second. A hummer is fixed on the top of kite and sounds with wind. Edo kaku is a smaller size of Edo such as 30-60cm in width and 60-90cm in height. 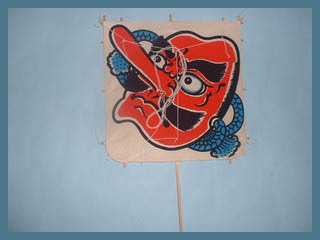 This kite is very popular as well as Yakko-dako in Japan. It has three bridles and usually two tails. CLICK for more Daruma kites !
. yakko 奴 servants in Edo . Slightly to the right you can see a Daruma Tako in the sky!
. 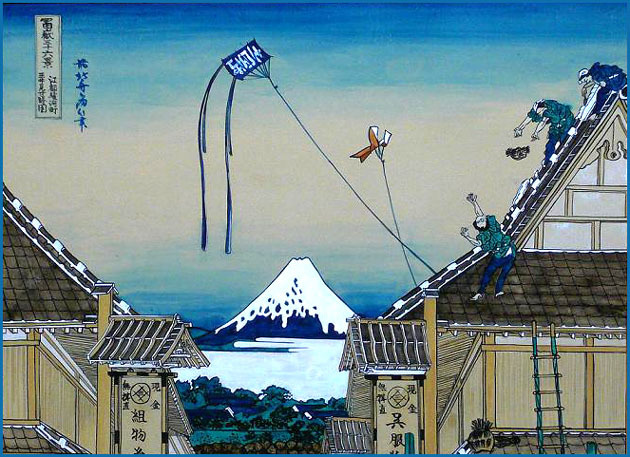 MORE Ukiyo-E about Edo kites . A Tako maker in our times . . . one of the few still working in Tokyo. He pays special attention to the beards of the faces he paints.
. naishoku 内職　home worker, side business in Edo . 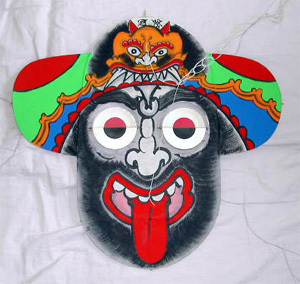 in the Tengu . . .
. Tengu 天狗 the long-nosed mountain goblin .
. seihonshi 製本師　bookbinder . It is more than a "picture book" for children. 漢文、学問、和歌の本などを出す「物の本屋」mono no honya for Chinese literature, science and waka poetry. Ezoushi - Also written 絵双紙. 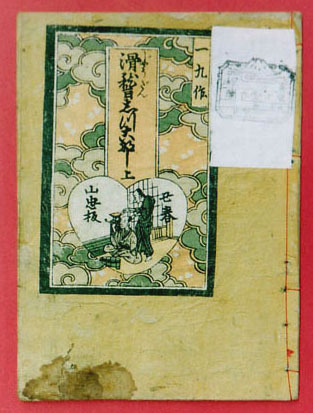 An illustrated booklet published during the Edo period. These were short publications written in kana 仮名 and illustrated with pictures reporting contemporary events, in journalistic or fictional fashion, or sometimes a mixture of the two. In a broader sense, various kinds of illustrated books such as *akahon 赤本, *aohon 青本, *kurohon 黒本, *kibyoushi 黄表紙, *goukan 合巻 and *eiri joururibon 絵入浄瑠璃本 are included in the category of ezoushi. These books were published in great numbers during the Edo period, and the publishers, who were often also booksellers, were known as ezoushiya 絵草子屋 or jihon tonya 地本問屋 (wholesalers of jihon). Jihon was a term used to distinguish the popular picture books and novelettes produced in Edo from similar books published elsewhere, or from books which were more difficult to read, such as scholarly works or classics. Two types of bookshop were prominent during the Edo period. One was shomotsu-ya which dealt in books of scholarly and religious material. The other type of bookshop was kozōshiya which published and sold mainly books for entertainment such as ukiyo-e and illustrated books called ‘kusazōshi’. 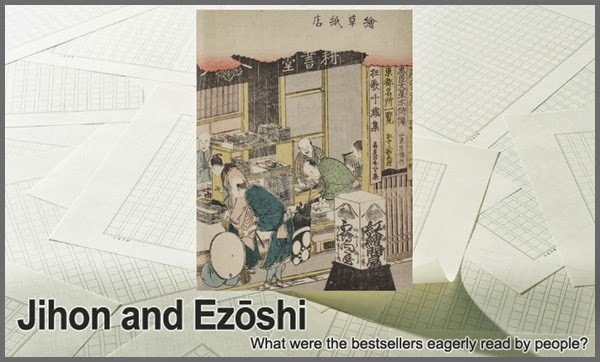 In Edo, kozoshi-ya were also known as jihondon-ya (sellers and publishers of local books) and these-- contributed to the evolution and development of many narrative arts that represented both the lives and values of Edo residents. Tsutaya Jūzaburō (1750 - 1797) was one of the most well-known heads of a jihondonya. He was involved in the publication of many book-genres and picture prints. These included Yoshiwara saiken (guidebooks of the licensed quarter), ehon (picture books), nishiki-e (colored wood-block prints), keiko-bon (collections of Japanese songs), and ōraimono (textbooks for children). He also enjoyed friendships with many persons of culture and high-education, whom he helped with the publication of their works. The Bunka era (1804-1818) saw the rise of a particular style of literature called gōkan (compendia) that was popular in Edo. Haikai (linked verses) was one of the most important literary genres of the Edo period.
. saiken　細見 "detailed guide books" of Yoshiwara and Kabuki . Kibyooshi Kibyōshi 黄表紙 "Yellow Cover Books"
is a genre of Japanese picture book kusazōshi (草双紙) produced during the middle of the Edo period, from 1775 to the early 19th century. Physically identifiable by their yellow-backed covers, kibyōshi were typically printed in 10 page volumes, many spanning two to three volumes in length, with the average number of total pages being 30. Considered to be the first purely adult comicbook in Japanese literature, a large picture spans each page, with descriptive prose and dialogue filling the blank spaces in the image.
. WKD : History of Saijiki . - What is Kusazoshi ? 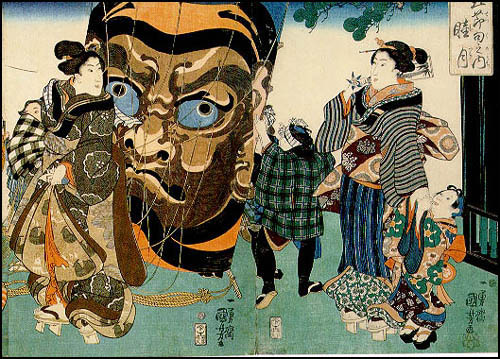 Popular stories which flourished from the late Kamakura to the early Edo period. The name derives from an early 18c collection of twenty-three short stories entitled otogi bunko 御伽文庫 (The Companion Library) collected and printed by Shibukawa Seiemon 渋川清右衛門, a publisher in Osaka. The title was changed to Otogi zoushi (The Companion Book) in a later version published in 1801. Once introduced, the term quickly became generalized to include a whole body of popular stories such as folk-tales, didactic narratives, war stories, etc. *nara- ehon 奈良絵本 dating from the Muromachi to the early Edo periods. The stories were also recited by chanters and priests sometimes with the help of illustrations *etoki 絵解. The illustrations were painted in a naive style using bright colors, usually by anonymous artists. 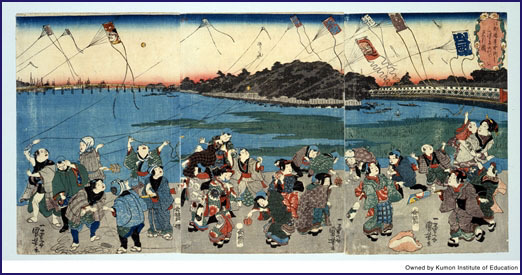 However, official painters produced a limited number of refined illustrations for the families of emperors and shoguns. 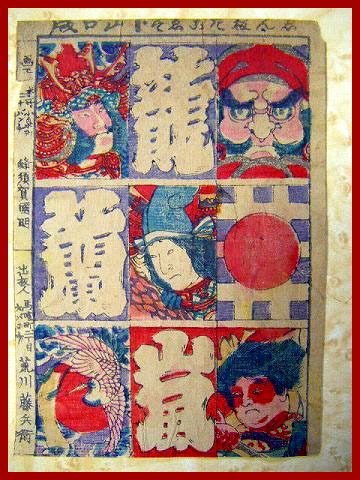 Otogi zoushi were the forerunners of Edo period *kana zoushi 仮名草子 (a story book in kana 仮名 script) and *ukiyo zoushi 浮世草子 (a story book of the floating world). Literary scholars today prefer using the terms Muromachi jidai monogatari 室町時代物語 (Muromachi Period Tales) or Chuusei shousetsu 中世小説 (Short Stories of the Middle Ages) to more precisely describe these short stories.
. Matsuo Basho and the Floating World . Lit. Books soushi 草子 of the Floating World (ukiyo 浮世). Printed books containing illustrated prose stories which developed from the kamigata 上方 (Osaka-Kyoto) region and flourished between the 1680s and 1770s. Ukiyo zoushi reflected the culture of the townpeople chounin 町人, and the subject matter was their lives, romances and pursuit of pleasure. The word ukiyo had a range of associations arising from the Buddhist sense of this transient world of sorrows. In works by well-known writer Ihara Saikaku 井原西鶴 (1642-93), this sense applied more particularly to what belonged to the present, and the varying manifestations of fleeting life in contemporary times. 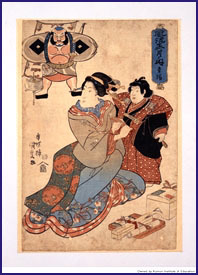 Saikaku also celebrated the human passion of sexual love koushoku 好色 in his novels, beginning with his KOUSHOKU ICHIDAI OTOKO 好色一代男 (Life of an Amorous Man ; 1682). Ukiyo zoushi came in a variety of forms and styles, but there were certain categories established by Saikaku in his major works. These included koushokumono 好色物, amorous pieces centering around the pleasure quarters, chouninmono 町人物, which dealt with the economic lives of townsmen, and setsuwamono 説話物, which included tales of curious happenings gathered from legends and folklore. 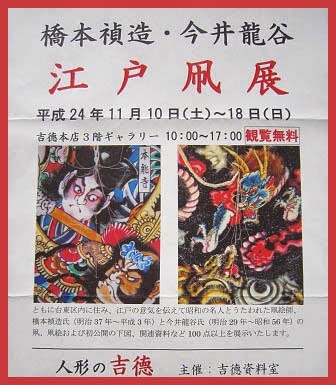 A fourth category dealt with bukemono 武家物, aspects of the lives of samurai 侍. At the time Saikaku was writing, popular fiction in an easily read script was referred to as *kana zoushi 仮名草子, and it was not until about 1710 that the term ukiyo zoushi was mentioned as a genre. Even then, it referred to the amorous fiction earlier known as koushokubon 好色本. It was later, during the Meiji period (1868-1912), that these Edo period novels describing the tribulations of this world were called ukiyo zoushi. The printed books generally came out in sets of five or six fascicles of hanshibon 半紙本, that is, books made from *hanshi 半紙 paper, folded in half and trimmed. The dimensions of these books could vary but were approximately 165 x 235 mm. (6 1/2 x 9 1/4"). Nishizawa Ippuu 西沢一風 (1665-1731) produced many ukiyo zoushi inspired by Saikaku as well as historical romances such as GOZEN GIKEIKI 御前義経記 (Yoshitsune's Story Told Before His Excellencｙ ; 1700). Ejima Kiseki 江島其磧 (1666-1735), author of KEISEI IROJAMISEN 傾城色三味線 (The Courtesan's Amorous Shamisen ; 1701), wrote books for the important Kyoto publishing house, Hachimonjiya 八文字屋. Kiseki and the bookseller Hachimonjiya Jishou 八文字屋自笑 (d.1745) as a team produced numerous ukiyo zoushi which were known as *hachimonjiyabon 八文字屋本 and served to make the genre more popular and accessible. Kiseki also developed a type of ukiyo zoushi known as katagimono 気質物, which consisted of sketches of townspeople and their doings. Designers of the illustrations in these books included the authors themselves, such as Saikaku, as well as prominent *ukiyo-e 浮世絵 artists. Nishikawa Sukenobu 西川祐信 (1671-1751), Kawashima Nobukiyo 川島叙清 (fl.1711-36) and Yoshida Hanbee 吉田半平衛 (fl.c. 1660-92) were well-known illustrators for these books in the kamigata region. In Edo, Hishikawa Moronobu 菱川師宣 (c. 1618-94), Furuyama Moroshige 古山師重 (fl. 1678-89), Sugimura Jihee 杉村治兵衛 (fl.c.1680-98), and Okumura Masanobu 奥村政信 (1686-1764) all produced illustrations for ukiyo zoushi. 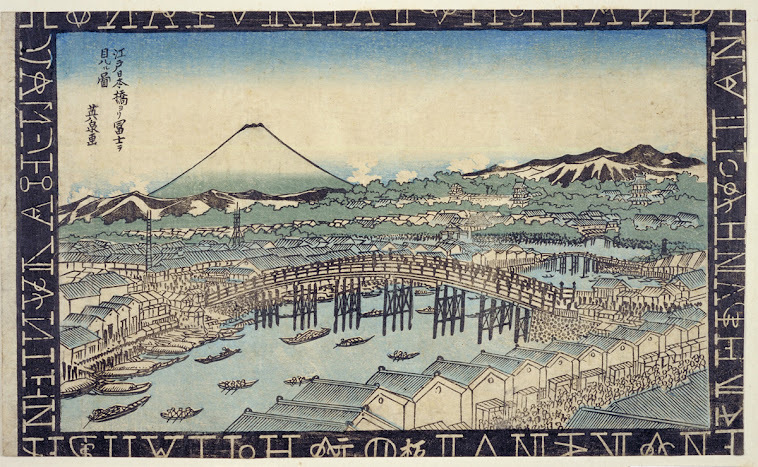 In around 1766, however, after the deaths of Kiseki and Hachimonjiya Jishou, the Hachimonjiya publishing house in Kyoto was sold, and ukiyo zoushi as a literary form was almost extinguished, although a few books of this type continued to be produced.
. Ihara Saikaku, Ibara Saikaku 井原西鶴 . 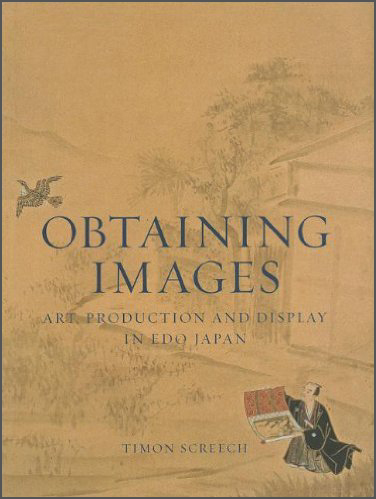 Obtaining Images introduces the reader to important artists and their work, but also to the intellectual issues and concepts surrounding the production, consumption and display of art in Japan in the Edo period. Rather than looking at these through the lens of European art, the book contextualizes the making and use of paintings and prints, elucidating how and why works were commissioned, where they were displayed and what special properties were attributed to them. Different imperatives are at work in the art of diﬀerent traditions, and Obtaining Images firmly anchors the art of Japan of this period in its contemporary context, offering a highly engaging and comprehensive introduction for the student and general reader alike. 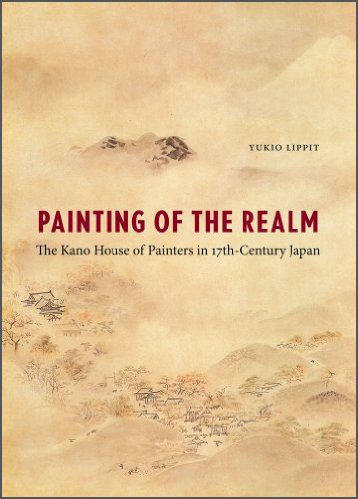 In this eloquent and far-ranging work, Yukio Lippit explores the seventeenth-century consolidation of Japanese painting by the famed Kano painting house, whose style evolved from the legacy of Zen monk-painters of the medieval era and intertwined Chinese with native Japanese practices. Legitimacy was transmitted from master to disciple in a manner similar to that in religious traditions. 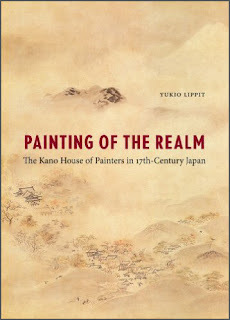 Lippit illuminates the role of key factors--bequeathal of artworks, authentication of art, painting in the mode of famous masters, collections of art, and the use of art in governance--in establishing the orthodoxy of the Kano painters and their paramount role in defining Japanese painting. The Painting of the Realm is pathbreaking in its analysis of the discursive operations of the Kano school and its posing of large questions about painting that exceed narrow artist-centered, formalist analysis. Lippit has undertaken a bold and dense study of painting production and reception, presenting original and compelling interpretations.
. kitan sooshi 鬼譚草紙 Kitan Soshi "demon stories" .
. shuppansha 出版社 publishing company, book publisher . furuhonya, furu-honya 古本屋 selling old books in Edo .
. Famous Book Titles from Japan - Edo .
. Teikin Oorai, Teikin ōrai 庭訓往来 textbooks . Janine Beichman has commented perceptively, "A quiet feeling of spring rain is splendidly evoked, but the identity of the browser is deliberately left vague in order to evoke better the quality of the rain." This is an excellent example of a shasei haiku. There is never mention of a "you" or "I," but the atmosphere is perfectly evoked.
. Japanese Architecture - cultural keywords used in haiku .